We provide homeowners with an trouble-free way to add square footage to your home. With Total Basement Finishing Systems, many apprehensions regarding expense, installation time, safeguarding against moisture and temperature fluctuations are problems of the past. The TBF basement system is customizable, and includes basement drop ceilings, basement flooring, and basement wall solutions that are more desirable than drywall. The TBF basement finishing system is mold and water resistant, and insulated. It has been created for basement environments by a company with over twenty years in basement waterproofing, Basement Systems Inc., and carries a warranty. Our contractors are backed by the Total Basement Finishing network, a collection of over 300 professional basement contractors throughout the United States and Canada. TBF contractors engage in extensive and ongoing training. We are the full-service basement finishing and remodeling contractor for Rhode Island, Eastern Connecticut, and parts of Massachusetts. 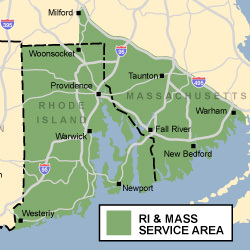 Our service area includesProvidence, Cranston, Warwick, Pawtucket, and Woonsocket. Visit our service area page for a full listing. Call. or contact us online for a FREE basement finishing quote in Rhode Island.